One of my first, distinct memories of DC is the long drive down Connecticut Avenue, after exiting 495 and headed to Dupont Circle. I was completely DC naive, had very little navigational or directional DC knowledge and for all I knew I could have been headed north or west or east. As I hesitantly meandered my way down Connecticut Avenue through the tree line Chevy Chase, past the sign to the National Zoo, little did I know that my first DC welcome would come from the majestic, patriotic, stone lion guardians of the Taft Bridge. Constructed from 1897 to 1907, the arched bridge is the work of architect Edward Pearce Casey and engineer George S. Morrison, known for his steel truss bridges. 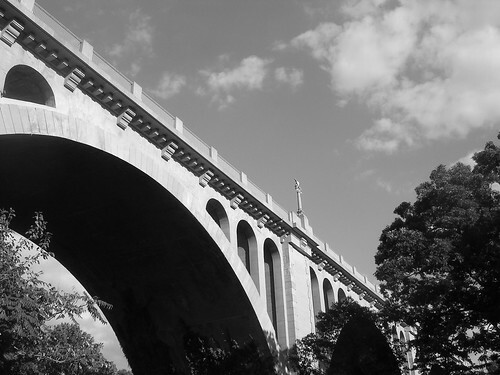 The bridge, dedicated to U.S. President Howard Taft in 1931, is the largest unreinforced concrete structure in the world and in 2003 was named to the National Register of Historical Places. The four guardian lions (two on each end of the bridge) that so impressed me and seared into my memory my first arrival in DC have fairly elaborate history. The figures were originally designed and sculpted in 1906 out of concrete to match the bridge by Roland Hinton Perry. 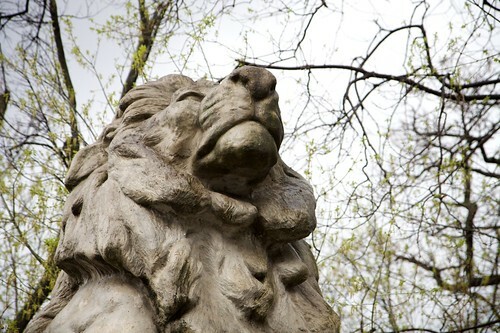 By the mid 60s, the lions were in need of restoration and unfortunately the weatherproofing efforts proved unsuccessful and when the bridge was rehabbed in 1993, they were found to be beyond restoration. In 2000, sculptor Reinaldo Lopez-Carrizo cast new molds of the original lions and the new feline centuries, made of high-strength concrete, debuted in the summer of 2000. If the bronze lions outside the National Zoo look similar to those of the Taft Bridge, it’s because they were all made from the same molds. The sides of the pedestrian and bike-friendly bridge are lined with iron lampposts by Ernest Bairstow in 1906. 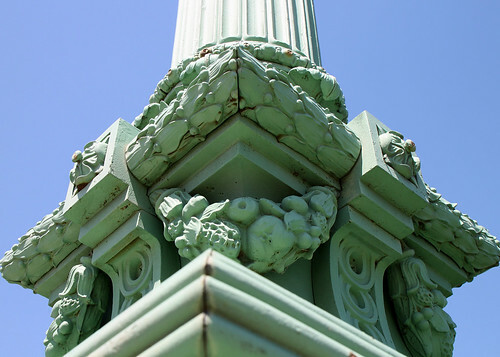 The painted lampposts feature pedestals decorated in garland, fluted columns with acanthus leaves at the top and bottom, and are topped with spread-winged eagles. The bridge connects the Kalorama and Woodley Park neighborhoods of NW, spanning the large Rock Creek gorge below. From the midpoint of the bridge looking to both the north and south, Rock Creek Park opens up and one can truly comprehend the vastness of this National Park that runs through numerous DC neighborhoods. The dignified, grand and protective welcome the Taft Bridge gives to visitors, commuters and denizens of the district, continually reminds me how proud and privileged I feel to live in DC and is a monument that continues to inspire no matter how many times I pass it.